The C111 was one of a series of experimental cars produced in the 1960s and 1970s. when the company was experimenting with new engine technologies, including Wankel engines, Diesel engines, and turbochargers using, the basic C111 platform as a test bed. Other experimental features included gullwing doors, leather trim and air conditioning. The first version of the C111 completed in 1969 used a fibreglass body shell and had a three-rotor direct fuel injected Wankel engine (code named M950F) mounted in the middle. The next C111 appeared in 1970. It used a four-rotor engine producing 370 hp (275 kW). The car could reportedly hit 180 mph (290 km/h). The company decided not to adopt the Wankel engine and turned to Diesel with its 5-speed manual straight-5 turbo-Diesel, the C111 broke nine diesel and gas speed records. With more aerodynamic bodywork the C111 eventually hit 200 mph (322 km/h). Mercedes-Benz introduced the C112 at the Frankfurt Motor Show in 1991 as a production sports car. It used a 6.0 L V12 engine mounted in the middle. Due to pressures to conserve fuel, and after accepting 700 deposits, the company decided not to proceed with production. 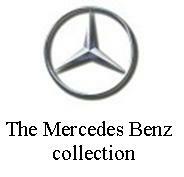 The Benz C111 is a new (2012) addition to the Museums Mercedes Benz collection. Built from the ARII kit it represents the Mk1 experimental car. The kit is basic and builds into a curb-side model. As there is no engine the bay only has a cover beneath the clear rear window. Unfortunately this means that a model built ‘straight from the box’ allows you to see through the windscreen, between the seats and on to and through the rear wheel arches. To avoid this on our model rear inner mudguards and wheel arches have been added together with a panel behind the seats as on the actual car. The body has been painted with Halfords acrylic cars paints with the detail painting done with Humbrol acrylics and enamels.